As we traversed the length and breadth of Gujarat, our feet ached and our spirits were slightly weary. So on the last day, when we were supposed to visit Champaner, all of us had second thoughts about actually making the trip. 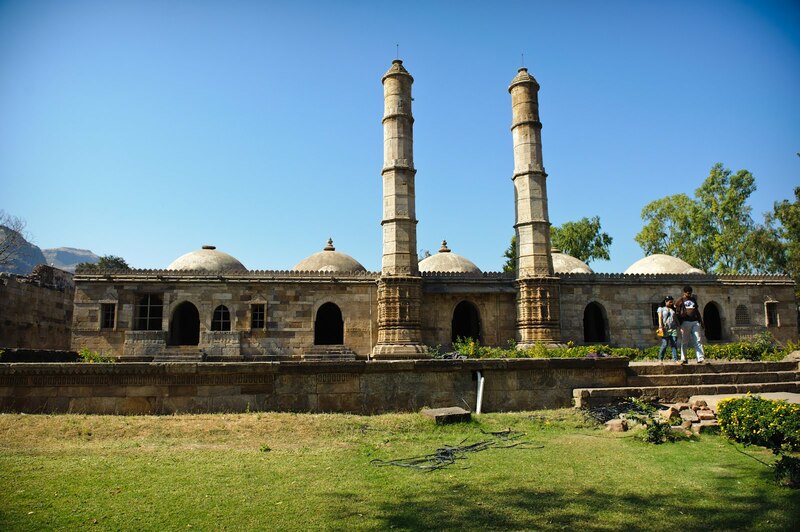 I had first heard of Champaner through a friend who was studying in Ahmedabad and would make a quick weekend trip to Champaner when he wanted to escape the chaotic clutches of city life. I remember him telling me about the mounted heritage structures scattered across the dusty little town. I had immediately then drawn a picture of it in my head and it certainly did seem like place I would have liked to experience. Out first stopover was at the Sahar ki Masjid which is a sandstone mosque with towering minarets etched with the most intense designs. My fellow travelers and I were the only ones in the mosque. That allowed me to seek my own space and as I walked pass the sturdy columns, the mosque took me back hundreds of years. The guide’s voice echoed in my head and his words brought forth an army of Jains, Muslims and Hindus who congregated at the mosque. The influence of all the three communities was starkly visible in the sculpted ceilings and doors. The wind was chilly and as my fingers traced the shivering marble centerpiece, the artwork narrated tales of the skill and time which must have gone into creating the momentous structure. The guide says that there exists no documented evidence of this place ever having been used as a mosque. And the geography of the structure complies as one sees the wide open space where conversations must have nurtured between columns. Our next stop was the Jami Masjid, another stupendous testimonial of the Mahmud Begada’s rule on Champaner when he made the city the capital of Gujarat. We were fortunate to have reached this Mosque just as a bunch of tourists were stepping out. As we paved our way through the stoned arch laced in lattice, the mosque came into view. It was lined by balconies and minarets and several local children who were perhaps on a school trip. Their buzzing bickering and colored outfits contrasted with the 15th century structure which rebelled with its symmetry and even use of sandstone. The afternoon sun played hide and seek with the latticed windows and balconies and drew pretty patterns on the floor. Pigeons cooed away in corners of the murky mosque. Two men discussed employment options sitting inside the cool carved space before the window. Children streaked pass the columns leaving their shadows behind. The large dome with intricate carvings offered protection from the heady sunrays. Time passed slowly and quickly, all at once. I was humbled by this feat of beauty which offered very limited utility in our current times but overwhelmed me with its powerful aesthetic composition. I am usually skeptical of history books and especially great rulers like Mahmud Begada. I always wonder about the lives lost, the struggle for power and the very need for a ruler to indulge in an extravagant expense of building a structure of this size and beauty when it could be used for the benefit of the proletariat. However, in that moment, I thanked Mahmud Begada for commissioning this mosque and creating a structure which has stood the test of time and empires. I was indeed grateful for this piece of history which could remind us of a time and world that was. I smiled as I thought about the employment this structure must have generated, the art which has been preserved and the hub that it acts like for the existing community. I sighed deeply as I felt my spirits rise and began walking towards the exit.